Snapchat is planning to show clips of the Winter Olympics to its users thanks to a new tool which allows television networks to send parts of live shows to the app. Snap partnered with NBCUniversal to pipe clips of the latter’s Olympic broadcasts to the app, along with live updates and contextual information. For example, if you catch a clip of the women’s slalom, you don’t have to open Google to find out what that is — Snapchat provides a context card giving you more information. The custom cards will also give information about current scores and medal tallies. 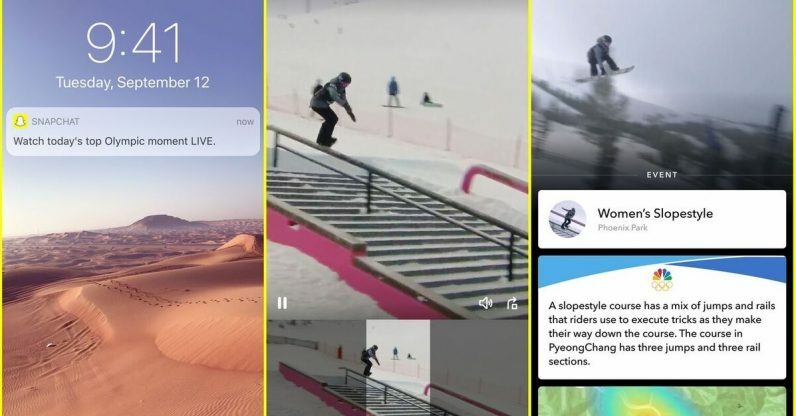 Snapchat’s bite-sized shows and video make sense for viewers who want to catch critical moments without watching the whole broadcast — which is probably a large portion of Olympic viewers, especially those who are more interested in summer sports than winter. Users can expect at least one clip per day, and may sign up to receive notifications when the clips are live. The new initiative is a test of a tool Snapchat created that allows TV networks to send parts of live broadcasts to the app. App users won’t be able to get the whole show — as Snap’s vice head of partnerships, Ben Schwerin, told the Wall Street Journal, “We do believe that the best place to watch a live game and a live awards show is on television.” But it’s a way of collaborating with the television networks without disrupting either their business or Snapchat’s. Snapchat will have two short-form shows on the Olympics throughout the coverage, in addition to the live clips. It’ll also have a number of Lenses, Filters, and other cosmetics during the games, but that’s just to be expected.